We have just returned from a too short trip to the island of Corfu. We spent only a week on this green Greek island and another couple of days on a ferry ride there and back. We visited beautiful beaches, enjoyed great food and of course partied as much as we could. I will try to put my observations and some useful tips in a following series of posts. As always, I also took some nice photos you can look forward to. The one above is just a taste of things to come. It features a charming beach near the village of Peroulades. The beach is called Logas Beach. :) I can't remember if I commented here or not yet! I know I was having problems commenting from my iPhone, but forgive me if it is a duplicate! Lovely photo. I have always wanted to go to Corfu but I guess I have a couple of priorities first! 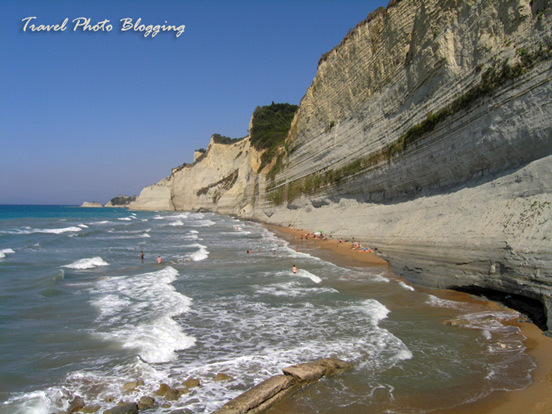 I had some friends which traveled last year to Corfu and they told me that the place is truly amazing. Wow Corfu is such a serene place, that now I wish to be there. Pic is very beautiful!